The solution is really simple : if there are no system load events, just add them ! This is just a three-step process. Now all we need is make sure this is sent every minute. The ubiquitous cron mechanism makes it easy. Let's just edit crontab by calling crontab -e and add a line like this. * * * * *		bash -c "uptime | logger -t uptime"
What's with the bash -c ? The thing is, in most cron implementations, it is not possible to run a pipeline, but only a single command. bash -c "some | pipeline" provides the way to wrap the pipeline in a single command without having to create a script just for this. And as to the five stars, they're just cron's way to describe a command to be run (1) each minute of (2) each hour of (3) each day of (4) each month, whatever the (5) weekday. First, define a format to use when sending the records. In most cases an existing format would already exist, but defining it explicitly helps us ensure platform independence. $template GRAYLOGRFC5424,"&lt;%PRI%&gt;%PROTOCOL-VERSION% %TIMESTAMP:::date-rfc3339% %HOSTNAME% %APP-NAME% %PROCID% %MSGID% %STRUCTURED-DATA% %msg%\n"
This directive sends everything over to the log server. In most cases, this is what you want, because your goal is likely to build a centralized log server. If this is not the case, adjust the *. * pattern to only send uptime information. Use of port 10514, or any port above 1024, instead of the default 514, makes it easier on your Graylog servce installation, not requiring it to be allowed to listen on privileged (below 1024) ports.
" 13:23:01 up 13 days, 21:42,  0 users,  load average: 0.02, 0.05, 0.10"
The information we need for the 1-minute load would be 0.02. We can get it using a regular expression extractor based on this expression: "^. *load average: ([\\d.,]+),. *$", completed by adding the "Convert to numeric" option to enable numeric processing on the result. Should we want the 5-minute load, here 0.05, we can use another regex, or a simpler "Split & Index" extractor, splitting on the comma and using target index 5 (1: " 13:23:01 up 13 days", 2: " 21:42", 3: " 0 users", 4: " load average: 0.02", 5: " 0.05", notice spaces), also completed by the numeric converter. Check the exact format of your uptime output. On some servers, I noticed the numbers would be formatted using a non-default locale, like fr_FR.UTF-8, causing the numbers to look like 0,05 instead of 0.05. To prevent the problem, add LANG=C at the top of your crontab file at step 1. Better than having to tweak extractors per-server. If you are centralizing data for multiple servers, be sure to filter by source too. At that point, the data is ready in Graylog. Head over to the Search page, and specify a filter on uptime: application_name:uptime. Assuming you named your extractor loadavg_1min, select that field in the list on the left, and unfold it, you should see a small table with three choices: "Statistics", "Quick values", and "Generate chart". Use the latter: your load average chart will be displayed on the right. Customize to your heart's content (my preferences: value → mean, type → line, interpolation → cardinal, resolution → minute), then add to the dashboard of your choice. Enjoy. The uptime_extractors.json file attached to this article contains the definitions of the two Graylog extractors for you to import on your Graylog instance. 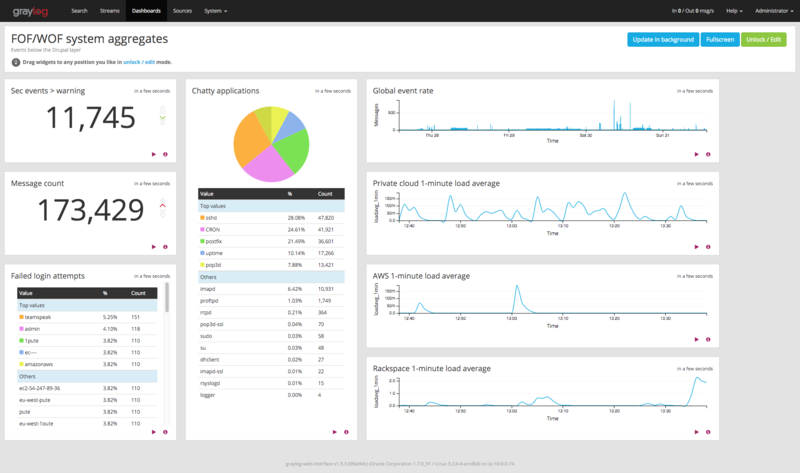 Much more information is available on the graylog.org site and repo at https://github.com/Graylog2/graylog-guide-syslog-linux.